Immortal’s entry into the then-emerging world of black metal was as typical as many of their fellow bands. Coming from a death metal background with Old Funeral (in which both members spent time), and before that Amputation – it was at the behest of Oystein Aarseth from Mayhem that these men changed alliance to the new, and more extreme sounding black metal style. The band is centered around the duo of vocalist/multi-instrumentalist Olve Eikemo (Abbath) and lead guitarist Harald Nævdal (Demonaz). Steeped in death metal influence this little heard, or often neglected debut “Diabolical Fullmoon Mysticism” is a curious little anomaly in the band’s first era. Immortal, who would make a name for itself with the two records following this one, plays much slower and is more atmospherically inclined at this point. The tradition of using a stylized band photo as cover artwork is started at this juncture, and this would merely be a steppingstone for the next two much more violent and purely black metal records. With the opening cut (after enduring a fairly pointless and entirely forgettable intro, aptly called ‘Intro’) ‘The Call Of the Wintermoon’ Immortal lays its card on the table. One thing that is instantly notable is that this sounds a lot like shortlived Norwegian death metal outfit Old Funeral. There are differences, most clearly in the vocal department, as Abbath here delivers his most devilishly shrieking performance. Compared to later Immortal recordings the tempo is fairly low and somewhat meandering. Outside of the blast section in the opening this track sounds a whole lot like standard European death metal with minimalist, colder, sharper riffing and croaking frog vocals, the prominent bass guitar riffs of vocalist Abbath only serve to consolidate this observation. This is the only album to feature drummer Gerhard Herfindal (Armagedda) and it is notable for not fully realizing the band’s winter and ice concept with which they would become identified just a few years later. Together with the intro, there’s also sparse usage of the acoustic guitar in ‘A Perfect Vision Of the Rising Northland’. In terms of riff construction the band draws heavily from Swiss genre-fusionists Celtic Frost, Bathory and Mayhem’s earlier death/thrash hybrid as it was heard on the “Deathcrush” EP. Along with Herfindal’s decidedly more death metal drumming, and the lower overall tempo in that area make “Diabolical Fullmoon Mysticism” the most debated album in the band’s extensive catalogue. Immortal had not yet decided what exactly it wanted to be. There are three strong tracks after the intro, and the album peters out a bit in the middle with ‘Cold Winds Of Funeral Dust’ and ‘Blacker than Darkness’. Both songs not only sound incredibly similar, but both fail to offer up a significant payoff. Thankfully the epic ‘A Perfect Vision Of the Rising Northland’ makes up for the relative inertia of the preceding two tracks. The track is introduced with a frail acoustic guitar bit, and includes some spoken word parts, which greatly add to the atmosphere of Northern darkness and desolation. Overall “Diabolical Fullmoon Mysticism” is a serviceable early black metal record that gets by on the graces of its novelty factor. The band’s transformation from death – to black metal band was mostly complete, but traces of the earlier style obviously remain audible in key departments and overall architecture. Only with the next album would Immortal fully transition into the style that would make them famous the world over. Immortal also was one of the earlier Norse black metal bands to self-produce relatively primitive but good looking music videos, and for this record they shot a somewhat comical promotional video for the track ‘The Call Of the Wintermoon’, which sees the band cavorting in a forest in tophats and capes. The band would continue this practice for the next album with a live performance video, before going a more stylish and professional route with its third and ultimate offering. As Immortal was in its early stages here it is not surprising to notice that a lot of the tracks are long and don’t really go anywhere. This defect would be rectified in future albums as the band cut their songs down to more standard length, and distributed its ideas more evenly across the album in question. Most tracks go anywhere from 4 minutes to 6 minutes, with the lone exception of ‘A Perfect Vision Of the Rising Northland’ clocking in at a mammoth 9 minutes – and ‘Cold Winds Of Funeral Dust’ not even reaching the 4 minute mark. The band’s concept of winter, evil and ice was still forming at this point, and would not come to full fruition until the follow-up to this record, the uniformly savage “Pure Holocaust”. The fantastic Blashyrkh concept would only fully arrive with the band’s third album, the crude sounding “Battles In the North”. It speaks volumes of the amount of confidence that Relapse Records had in their newest signee to release this demo compilation as early as they did. Released in 1999, just one year after “Amongst the Catacombs Of Nephren-Ka”, and one year before “Black Seeds Of Vengeance” this compilation houses both the band’s demos: “Festivals Of Atonement” from 1995 and “Ramses Bringer Of War” from 1997. The self-titled demo from 1994 is curiously absent from this compilation, but would be re-released much later as the “Worship the Animal” EP in 2011. Which is understandable in a way, because here Nile sounds far closer to the sound they’d have on their official, label-sanctioned releases. 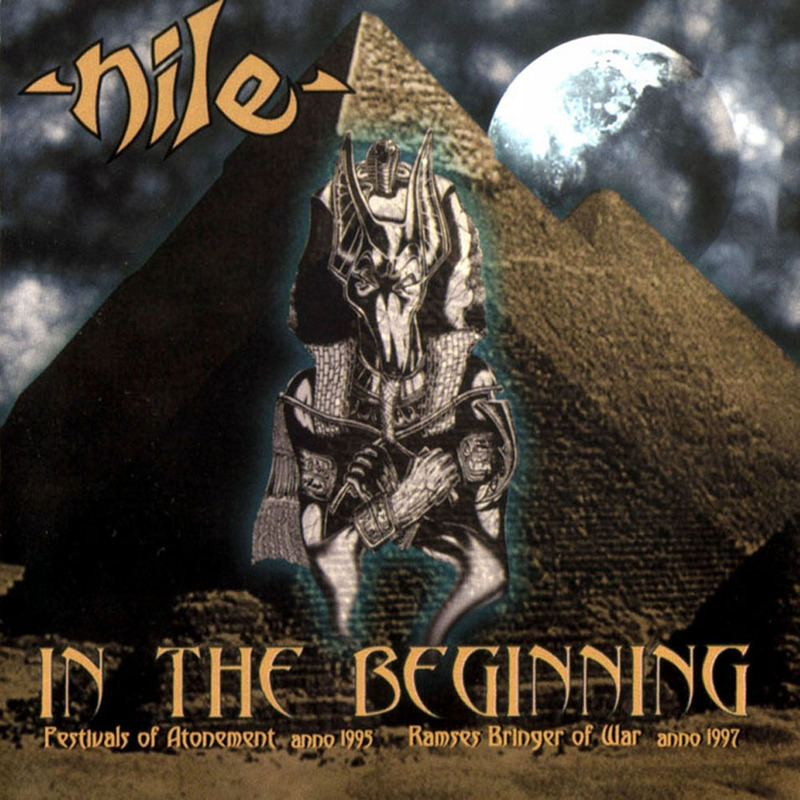 “In the Beginning” sees Nile at its most primal, embryonal form – but already the band’s incredible sense for musicianship and arrangements shine through in these demos. The album opens with the “Festivals Of Atonement” demo session from 1995. ‘Divine Intent’ is a strong opening with tribal drumming, but despite the impressive framework the track goes nowhere, and doesn’t deliver the climax hinted upon. There is a hypnotic charm to the repetitious riffing, and the thrash acceleration is highly effective. ‘The Black Hand Of Set’ is the signature track of this demo, and it is unclear why it wasn’t later re-recorded for the debut. The track is faster, more brutal and, more importantly, the most ambitious cut in terms of composition and arrangement. In fact, I’d wager a bet and say that ‘The Black Hand Of Set’ formed much of the template from which the band would later go on to write the subsequent demo. The use of Egyptian scales, melodies and interludes is understandably scarce, as both the band and their financial leverage, were at the minimum when this was recorded. The demo is also notable more conventional death metal in terms of arrangement and overall delivery. The whole is more loose, and not nearly as rigid and mechanical sounding as the band’s later recorded output. Vocally, there is more of a thrash shout than any real grunting that is used here. The three-way vocal interplay between Karl Sanders (lead guitar), Chief Spires (bass guitar) and Pete Hammoura (drums) is introduced as early as this. All three men have a distinct voice, and the alternating of lines/verses is as effective and poignant sounding here as it would be years later. The solo’ing is present, but it is more restrained and conventional sounding than it would be in subsequent years and albums. ‘The Black Hand Of Set’ is the fastest, most technical track of this demo, and it forms the backbone of what the band would later write. It is the signature track of the demo, and is literally the stand out track, because no other track on the demo sounds as accomplished musically as this one. ‘Wrought’ starts off with an ethnic intro segment, but it is a superficial addition to flavor up the death metal violence. There is even some clean singing in this track. It is built off a similar template as opening cut ‘Divine Intent’ with tribal-like drumming and churning chord progressions that recall early Morbid Angel and Incantation in equal measure. The second half introduces some hokey sounding synths, but these are mostly redeemed by Pete Hammoura’s barbaric drumming and an excellent wailing guitar lead/solo. Following this we arrive at the 1997 “Ramses Bringer Of War” demo session. All three tracks were written from the template of ‘The Black Hand Of Set’ from the preceding demo session. These cuts are significantly heavier, meatier and faster than the cuts from the 1995 session. It is not very surprising that all these three cuts would eventually end up in their definitive form on the band’s 1998 Relapse Records debut “Among the Catacombs Of Nephren-Ka”, along with seven new original tracks written specifically for the session. 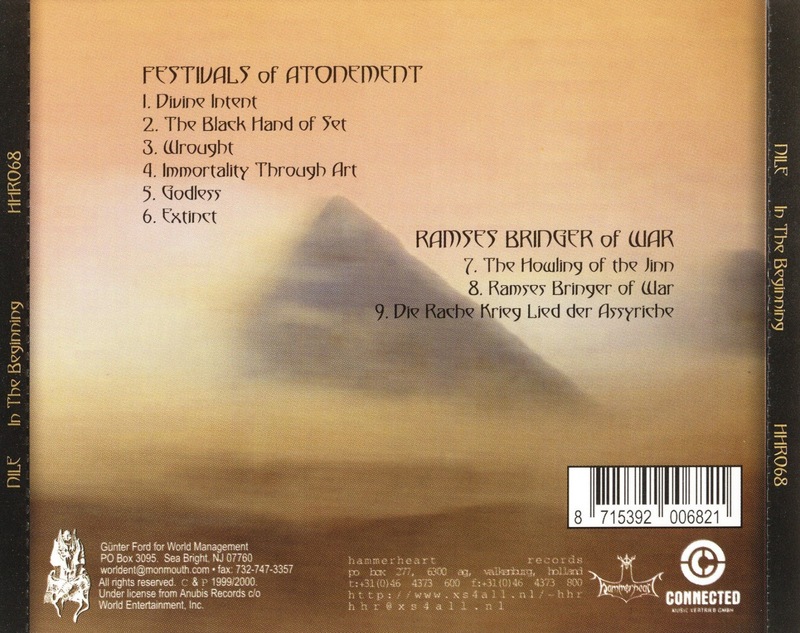 There are no significant different between the original versions and the renditions that later appeared on “Amongst the Catacombs Of Nephren-Ka”. The songs are played less fast, and somewhat looser on this demo recording – but beyond that and the lower production values there are no immediate differences in terms of writing. Notable is that “Ramses Bringer Of War” sounds far darker, malevolent and all around more brutal than the preceding demo. The grunting comes into full bloom, and Nile’s early writing is now finally complete. In five years Nile had undergone a steep evolution. Both demos were recorded at Sanctuary Studios with producer/engineer Jimmy Ennis. Considering other demo tape releases of the time, it is surprising how good this actually sounds. There are shortcomings, of course, the production misses balance and not all instruments are evenly distributed in the mix. When the vocals, drums and keyboards play at full swing the guitars tend to get buried due to the limited channels available. The drums sound far more commanding and powerful than on the 1995 demo. The ethnic interludes and segues sound less strong than they would on the subsequent album, but this is merely due to financial – and time restrictions on part of the band more than anything. On all fronts Nile had made significant strides forward in terms of playing and writing, trimming all excessive fat and no longer meandering around aimlessly. It is not surprising that Relapse Records decided to contract the band based upon this tape. “In the Beginning” is an interesting historical document into the early years of one of South Carolina’s most identifiable death metal institutions. It will probably not appeal to the youngsters that go to know the band through their later records (say, “Annihilation Of the Wicked” and onward) – but those who adore Nile’s earlier, more stripped down direction will find this interesting to see from whence they came. It is a pity the self-titled demo wasn’t included here, because then one could have seen the band’s entire evolutionary transformation one step at a time. From the humble thrash metal beginnings and see the band’s gradual conversion in terms of skill level, writing and playing with each new recording venture into the highly respected band they are today. Those who love archive and historical recordings will find a lot to like here. “In the Beginning” is worth of a cursory glance, for old and new fans alike, to say the least.